Escape to this green paradise of eastern Madagascar. From the popular park of Andasibe, journey to Ampitabe Lake for a boat ride along the Pangalanes Canal, then relax on the beautiful island of Sainte Marie where you will enjoy whale watching. Madagascar’s East was once a continuous lush green corridor of moist lowland forests extending along the eastern cliff edge with an altitude of up to 800 metres. Under this immense forested canopy, a countless number of species found an ideal habitat. Unfortunately, the fate of this natural balance reversed completely and these forests are now one of the most threatened habitats in the world. A boat cruise on the Pangalanes canal shows the coastal line either side of the channel full of single-crop farming plantations: lychee, sunflower, coffee, cocoa and of course vanilla. Along your journey, you will visit and explore Andasibe Analamazaotra national park and can enjoy a night walk to spot the noctural species. In July and August humpback whales migrate to Malagasy waters to calve and mate so Saint Marie Island is traditionally regarded as one of the most rewarding whale watching sites. 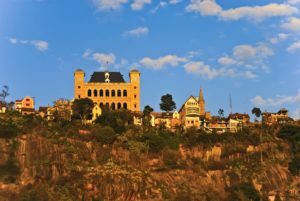 Today, you will fly to Antananarivo, the capital city of Madagascar. Let us take you to a lifetime memorable experience. Nestled in a wooded park, this Art Deco hotel is conveniently located . Enjoy a moment of pure escape in the on-site Spa M’Aloe dedicated to your well-being and have a swim in the outdoor heated pool. After breakfast you will travel to Andasibe. As the road winds through the hairpin bends and turns you will have the opportunity to observe the daily activities of remote villages along this road. You will be passing terrace rice fields and bustling road side stalls with all the tropical fruits. Travel time approximately 3 hours depending on the road traffic. In the evening around 6pm you will be guided through the Analamazaotra Park on Night Walk to spot the nocturnal animals including the ‘Goodman Mouse lemur. Experience the rainforest after dark where nocturnal lemurs, chameleons, geckos, frogs and fireflies come alive. The night walk can take 1½ – 2 hours. You will be trekking through beautiful waterfalls and landscape that will lead you towards a natural swimming pool where a cascade of waterfalls. Bathing is allowed so bring your swimsuits! 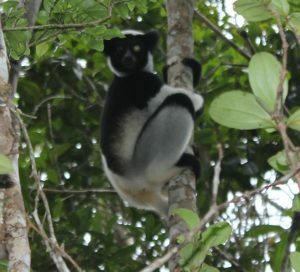 Along the track, where you can generally hear the screams of the Indri indri you can also see some orchids. 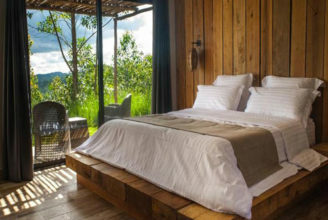 It is an exceptional rainforest ambiance. There many circuits to choose from depending on your fitness level. The easiest trekking with well paved paths can take from 2-3 hours and is up to 3 kms. Today you will travel to the Pangalanes Canal. 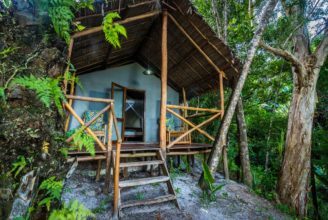 Your ecolodge is located on Ampitabe Lake which is the 3rd largest lake of the Pangalanes Channel. 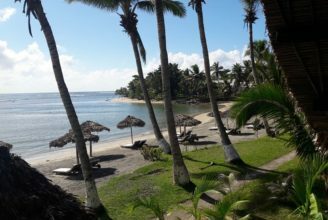 Pangalanes Channel Hotel – Bush House is a small ecolodge located on the east coast of Madagascar, on the Pangalanes Channel. A unique blend of nature offers marine worlds within walking distance. Your ecodloge proposes a unique blend of nature offering marine worlds within walking distance. Inland, there is a beautiful lake with a sandy beach; while only five kilometres away a narrow stretch of land separates the lake from the wild Indian Ocean. After breakfast you will take a boat tour of the Pangalanes Canal for 2 hours. You will discover Mahanoro which means “happy-making”. This word perfectly describes the daily life of the inhabitants of the East Coast. You will see the fisherman retuning after their catch in the sea, after you will continue your journey through the canal to see a herbal medical plantation. You will finish with a fresh BBQ seafood lunch on the sandy beach with entertainment from local musicians. La Pirogue is located on the east coast of Madagascar in the village of Mahambo on the Pangalanes Channel. After an early breakfast at 6am you will travel to Mahambo to take the ferry to Saint Marie Island, travel time 2:30 hours. From July until September it is possible to see whales around these waters. Upon arrival you will be transferred to your hotel. Transfer time will be approximately 20 minutes. An Indian Ocean hideaway, it combines the simplicity of the South Pacific with the barefoot chicness of a boutique Caribbean hotel. Today, you will take a tuk tuk tour of the island. Saint Marie Island, or Nosy Boraha, is a narrow granitic island 57 kilometres long off the east coast of Madagascar. 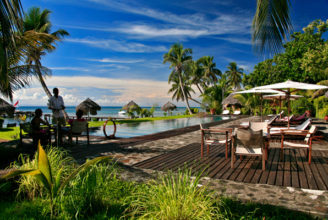 This tropical paradise with endless palm fringed beaches and bays is surrounded by coral reefs. 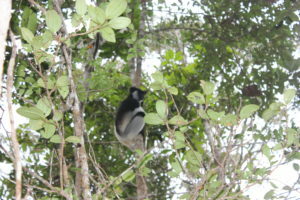 The island boasts lush vegetation with many species endemic to the island. The landscapes are diverse: on the South the small Ile aux Nattes has a magnificent lagoon, on the East there are mangroves, on the North there are natural swimming pools, the forests are in the centre and most of the activities are to the West. The island offers lush vegetation with orchids, clove trees, cinnamon, vanilla, and many others. This is a full day excursion to discover the most beautiful landscapes of Saint Marie during the day. You will come across small villages, forest, wild beaches, mangroves, rice fields and so much more. You will learn everything about vanilla, cinnamon, clove and orchids and the Malagasy way of life on the island. Today you will take a boat trip to watch the Humpback Whales. Madagascar is one of the best places to see Humpback whales. During July and August scientists, photographers and whale lovers gather on Saint Marie Island to study about this remarkable whale species. Every year Saint Marie celebrates with a whale festival proposing a variety of events. More than 7,000 humpback whales migrate to Madagascar waters from the Antarctic every year from June until November. Saint Marie is an ideal place from which to watch the stunning mating rituals and calving of the whales. They come to these warm waters to mate, breed and calve. Our specialist guide will explain to you about humpback whales and with the on-board hydrophone you will be able to listen to whale songs. One of the most amazing experiences is listening to the male’s unique song, one of the most complex vocal displays in the animal kingdom. Also you might be lucky to witness one the dramatic displays of physical dominance and acrobatic stunts of the males to draw the attention of the females making for a truly awe-inspiring experience for spectators. After lunch you will take your flight to Antananarivo. The flight time lasts approximately 1:05 hours. You will be transferred to your hotel, depending on the traffic, it may take 45 minutes to one hour. In the evening witness the best sunset with sundowner drinks at Lakonga. 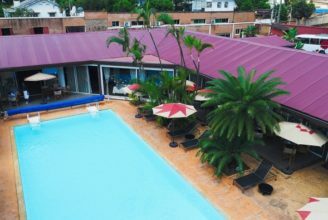 It is the best place to say cheers to a great trip around Madagascar with a glass of champagne, a beautiful view of Antananarivo and to look back at the great times you had. 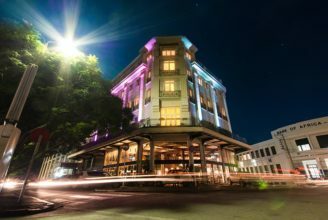 Le Louvre Hotel & Spa is situated at the heart of the business district of Antananarivo. The hotel offers breathtaking views of the capital. After breakfast you will visit Ambohimanga. Located some 21 kilometres northeast of the capital, the World Heritage spot of Ambohimanga consists of a royal city, a burial site and an ensemble of sacred places. The city remained forbidden to foreigners up until 1895, a date which corresponds to the beginning of the French Governorship over Madagascar. To enter the village, you have to come through a very ancient gate, which, once upon a time, used to be blocked by a gigantic round stone. This stone rolled in a furrow dug in the ground until the entrance was totally blocked. This gate is called Ambavahaditsiomby which in Malagasy translates to “where even a zebu can’t come through”. You will have a Malagasy lunch with a Malagasy historian to learn about the history of Madagascar. As you have lunch you will look at the beautiful blue hills that united modern-day Madagascar.